Whether it’s high winds, large hail, frequent lightning, or flash floods, severe weather has the potential to cause serious injury and property damage. Camps and conference centers in every state have the potential to face severe weather this season. Although severe weather occurs year-round, spring is a time to be on high alert. Now is the time to review your severe weather plan before it’s too late. Understand the National Weather Service’s weather watch/warning system and determine when to activate your plan. Determine how staff will be made aware of approaching severe weather and what action to take. Staff should be trained according to your plan so that they can act swiftly and effectively when needed. The first priority when severe weather hits is making sure everyone is safe and out of harm’s way. Don’t take chances when it comes to severe weather. If thunder can be heard, you are at risk of a lightning strike. Everyone should seek shelter indoors. It is especially important to evacuate any swimming areas if lightning is possible. Wind gusts can be dangerous, too. Falling limbs and trees can cause serious injury. Campers should seek shelter during strong wind events as well. During a tornado, cabins are likely an inadequate source of shelter. Have a plan to move campers to a sturdy structure or a building with a basement if possible. Attention should also be paid to your buildings. Your efforts well before a storm arrives may help to prevent property damage. Trim branches and trees which overhang buildings. Repair or replace your roof covering so that wind and hail will cause minimal damage and will be less likely to lead to interior water damage. Secure loose items which are prone to becoming wind-blown as these can become projectiles during strong winds. We’re here to help! 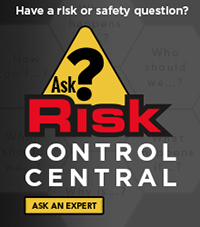 For additional questions, contact Church Mutual Insurance Company’s Risk Control Central.